We are delighted to announce that a brand new travel website promoting some of Britain’s most quirky, unusual and exciting places to stay has just launched, and has teamed up with the charity, donating 5% of every listing fee to the Family Holiday Association. Host Unusual, based in Leigh-on-Sea, Essex, is the creation of Dawn Crawford, the owner of one of the UK’s first online vintage boutiques. Having run this business successfully for nearly 13 years, she wanted to branch out to the promotion of vintage and retro properties. Cataloguing holiday properties from lighthouses to tree houses and everything in between, Host Unusual brings some of the country’s most extraordinary hidden gems as an antidote to the ordinary, at a time when ‘staycations’ are growing ever more in popularity. With categories including ‘Vintage and Retro’, ‘Eco-Stays’, ‘Towers and Forts’, and even ‘Private Islands’, Host Unusual will help tourists find somewhere rather more original for their holidays this year. There’s even a ‘Wildcard’ category, listing anything too unusual to pigeon-hole – such as a Norfolk cottage with a quirky secret to their swimming pool, and a prison-themed cell in the basement of a Georgian townhouse in Margate! The idea grew as Dawn’s team discovered more and more unusual accommodation in the process, and Host Unusual is now taking shape as a comprehensive directory of all places quirky! “I’ve been amazed at the diversity of unusual accommodation available in the UK, as well as the ingenuity of the owners who have created some truly unique vacation spaces for a holiday to remember,” says Dawn. 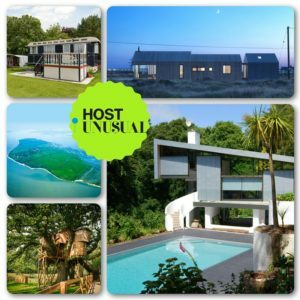 To celebrate the launch of the site, Host Unusual is offering the chance to win a £250 holiday voucher to spend on a stay at any one of its listings, whether that’s a luxury cave, an old windmill or an award-winning architect-designed house.